Stained glass lovers and enthusiasts have a shared love and appreciation for stained glass. 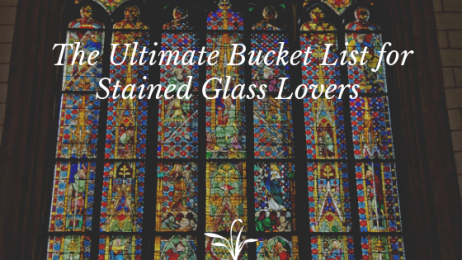 With so many unique, beautiful stained glass collections featured throughout the world, creating a bucket list can seem daunting. As stained glass enthusiasts, we’ve been compiling our own list. Here are our favorite stained glass pieces from around the world. The Augsburg Cathedral, located in Augsburg, Germany, features some of the oldest examples of stained glass found within the world. With different biblical figures found throughout the church, these elegant stained glass pieces are noteworthy for any history buff, stained glass enthusiast, and art lover. The Chartres Cathedral, located in Chartres, France, features amazing rose-colored stained glass that showcases the birth of Christ. A capturing glow is created whenever the sunlight hits these antique stained glass windows that were created in the early 13th century. Saint-Chapelle, located in Paris, France, has an incredible stained glass collection composed of 1,113 narrative stained glass pieces. These biblical narratives tell stories from both the New and Old Testament. Frank Lloyd Wright has been referred to as the first great American architect that designed homes in terms of furniture as well as architecture. Frank Lloyd Wright has created beautiful stained glass to complement his homes– this style is still used in modern day stained glass. Prairie Style Stained Glass For Your Houston Home from Houston Stained Glass on Vimeo. Houston properties can take inspiration from stained glass collections found throughout the world. These renowned and historical stained glass collections have a lot to offer– those looking to create their own custom stained glass can create inspiring pieces for their church, beautiful privacy art for their homes, and eye-catching features for their business. For more information regarding custom stained glass services for your Houston property, please contact us!